This page features any projects completed since the publication of the guidebook. Come here before visiting a venue if you want to know what new problems have been done. Crags are listed in alphabetical order. If you’ve done the first ascent of a new problem, please let me know on lancashirebouldering[at]gmail.com and I’ll include it here. On Grey Wall, page 123. Project 11 has been climbed, though due to discovery of a previously buried foothold, this is not very hard or worthwhile. The arete climbed to the top may make a decent highball, but the landing would need flattening. On the small vertical wall with the traverse Bumble Town. Guys Bein’ Dudes – SIT 6C - Sitstart facing right and climb straight up the middle on small holds, to gain larger edges. Bradley Bushell 2017. On the Trad walls. Page 288. On The Offwidth and The Anvil . Page 292/3. On the first boulder in the Back Edge. Page 294. Sloper’s Slopers – 6B+ – Start on holds right of Nik’s Arete and traverse leftwards to finish up Nik’s Groove. Sleepless Nights – SIT 6A+ – Sitstart the right arete, using the big sidepulls to the left. On the Big Roof. Page 298. Iron Lady – LOW 7A - The right hand line. From undercuts, gain the lip then top out directly above. John Wilson 2015. On the Trig Point Slab. Page 300. Trig Slab RH – 6B SIT 6B+ – A good sitstart has been added to the RH variant. From LH shelf and RH pebbly edge, pull up and left to gain the LH sidepull and continue up the slab. The foot-ledge is not allowed, nor is the big undercut used on the 6A version. Trig Of The Light – 6C+ SIT 7A – From LH slopey shelf and RH pebbly edge, head straight up, staying off the sidepull and undercut out left, and the arete out right. The foot-ledge is not allowed. A big rockover leads to balancy pebble pulling. Trig Arete – 6B+ SIT 6C – Although an online video shows the foot-ledge being used, it’s a better problem (and no harder) if eliminated. In the Trig Point area, page 301. Vangaurd – 7A – Climb the nose of the roof on its right (problem 25) with a slopey finish. RM 2014. On the short wall in the corridor above and behind this buttress. Matt’s Problem – SIT 6A – Climb the arete and pinches. On the Hueco Block. Page 303. Tom’s Problem – 6B+ – Between Ape Hour and the arete to the right, start low on the right arete up to the break then yard up with the left to a crimpy edge about 10 cm below the top in the middle of the bloc (above Ape Hour) then slap for glory. Hueco Slab Traverse – 5+ – Start on the right arete of the slab. Traverse left and finish up Hueco Arete. In the Short Routes area, Page 305. Naomi’s Wall – 6B SIT 7B+ - The new sitstart goes from LH sidepull and RH flatty left of the arete. Make a big move to a distant sloper, then finish up Naomi’s Wall. VIDEO: https://vimeo.com/137792116 Mike Adams 2015. In the Beyond area. Page 309. Helter Felt Ya – SIT 6B - The centre of wall between The Skelter and Merry Go Rounded. Start from RH sloper and LH sharp side pull. Pull up the wall without using aretes, though left hand side pull higher up is fine. Directissima – 6A SIT 7A – Use the big sidepull to make a hard sitstart onto the slab. Eliminating the two break slots and the flatty just above is The J P Sitter SIT 7B. Johnny Peak, date not known. Herd It Here First - 6A+ SIT 6B - Climb the arete on its left, from a sitter with hands on the lower block. Use the arete and anything you can reach. Sneak To Bounty - 4+ SIT 6B+ - The arete on its right has an awkward sitstart (this is the line mistakenly shown as Hark To Bounty in the guidebook). Bounty Hunter – 5+ SIT 6C+ - Sitstart up the centre of the rippled wall to gain the standup. The Ox Wrestler – 6C - Start clamping the aretes and slap upwards. Finish via the jug on the right arete. Man’s Not Hot – SIT 6B - Sitstart under the roof, hands matched on the blobby end of the obvious juggy ledge. Follow the ramp out to the lip and pull round to finish up Man Alive. Breathe In – 4+ SIT 6C - Start both hands on the juggy ledge under the roof. Make a couple of powerful moves to gain holds up and right, then rockover back left to the ledge. Stay off the right arete. In the Small Quarry, pg. 130. A few problems on the lower tier have been extended due to landing changes. This Game Of Golf – 5 SIT 6B - An awkward sitter from hands in the break. Avoid big holds out right. A footblock has been moved, though the standing start was also previously undergraded. Calculus Made Easy – 6B - The wall just right of the crack. A tricky start leads to an interesting finish. Landing has been flattened, so this is harder than before. Essentials Of The School Of Algebra – 6A - Climb just right of centre. Landing has been flattened. In the Small Quarry upper tier, several problems have been cleaned and extended on the first buttress on the left. Leaf In The Storm – 4 SIT 5+ - Climb past the short crack and gain the big hole. Bird Of Paradise – 5 SIT 6A - Make a tricky move to the jug in the breakline, then climb upwards, staying right of the big hole. In Weasel Quarry, pg. 135. On the roof boulder, pg. 270. In the quarry, pg. 272. In the quarry, pg. 273. On the Fertile Delta wall, pg. 71. On Main Wall, pg. 94. 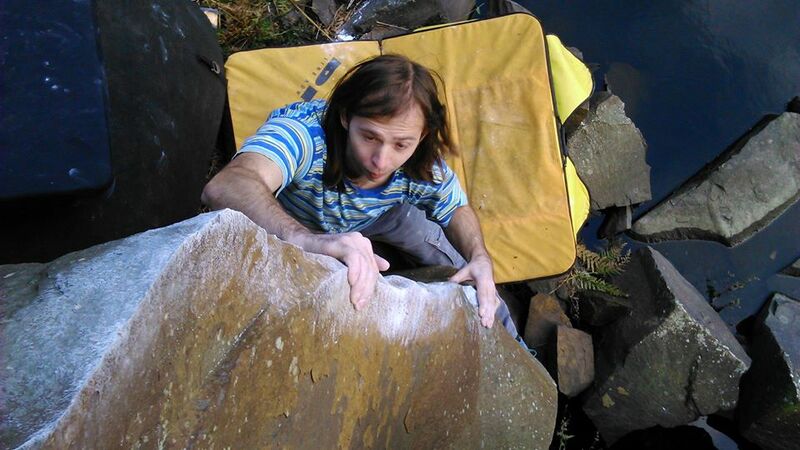 Scrittle Massala – 6A+ – Right of Tangled Up In Blue, climb the scoop feature on its right, above a terrible landing. On the Upper Tier, p.193. Competition Horror Show – 6B+ SIT 6C - The sitter adds a grade. Dingle – 5 SIT 6B - The sitter adds interest. A nice heely move leads upwards. Aunty Climax – SIT 6C - Climb the left arete of Pop, on its right, with hands on the arete only, going for the top of the arete, not out right. Don’t use the footblock – it’s an awkward sitter but just about works if you arrange mats, and the climbing is decent. RM 2018. Momentary Violin – 6B - Project 26. Climb the hanging wall without using anything below the lip. One tricky move to pull on, then easy to the top. Feed Me – 5+ SIT 7A - Sitstart with hands on lip pinches and a foot on the solid lump out left, pull up to better holds. Surmount the lip (standup) and finish straight up. Stay off the other chossy foot possibilities in the cave. RM 2018. Unnamed – 5+ - Project 1, p.281.Start in the pit, from holds on the back wall. In the Clown’s Pocket area. The Lamp – 5 SIT 7A - Left of Steep Start Wall (problem 3) and right of the corner. Sitstart from curving LH edge and low RH sidepull. Make a tough move up and left to better holds, then carry on to the good ledge (and beyond if you like). Stand Geoff Hibbert 2010. Sit RM 2018. Dragon Horse – sport 7b+ - Left of Steep Start Wall (problem 3) and right of the corner. Start from good holds just right of the corner. Traverse right, staying below the break. Finish on the flake just right of Crescent of Embrace. Steven Li 2016. In the Far Bay, see map on pg. 232. Downclimb or drop off at the top. Toad Of Resistance - 7A+ The wall left of the arete, without using the arete or the niche up and left. Dynamic. RM 2015. Truntillio – 6B – The arete on its left. Amagicka – 6B - The wall just right of the corner, with a big foothold to rock onto. Omeron – 6C - From holds on the slopey feature, rock left to better edges. Opposite the Far Bay main wall is a short overhanging wall. Again, drop off rather than topping out. Oversight – 6A - Traverse the break from left to right. In the Cul-de-sac, p. 235 is a wall with a brilliant feature. This wall is best visited in summer, as it is often damp during the rest of the year. The Longest Sloper In The World – 6A - Balance upwards. Shapeshifter – 6B - Climb past the right end of the sloper, with an awkward move to reach it. Pull-De-Sac – 6C - Climb edges to an interesting top section using thin horizontal pinches. Avoid stepping left to the sloper. Scent Of A Human - 6B - Make interesting moves to gain the small nose, then the top. In the Top Bay, pg. 125, on the short wall just left of Project 3. Pic HERE. More problems have been done in another bay on the upper tier. The Wizard Of Tod – SIT 7B – From sitting, climb Tantalicious without the footledge. John Wilson 2014. Boardwalk Empire – SIT 7A – Start on the jug of Footloose And Fancy Free. Traverse right to finish up Tantalicious, without using any holds below the lip. The footledge is allowed. John Wilson 2014. Ringdance – SIT 7A+ - At the back of the middle bay, there is an overhanging wall hidden in a corner. Sitstart this from the right arete and traverse left to pull round the left arete and finish on the face. RM 2015. Stutter Step – SIT 7A - Climb the wall just right of the slot, without using the slot. RM 2015. Bad Mama Jama – 7A+ - In the end bay, climb the tall arete on its left. Stay right of the corner crack. Problem 23, pg. 144. RM/DS 2016. Battlestar – 7B LOW 7B+ SIT 7C - The bulging wall right of the Indian Face arete, using anything except the left arete. The low start is from matched on the undercling. Stand & Low Start Dawid Skoczylas 2016, SIT RM 2016. The undercut bulge on the left end of the crag features a few problems that didn’t quite make it into the guidebook. Nutcracker – 7C+ – From the large flat jug, follow the crack leftwards to the other big flat jug. Holds above the crack are out, as is the large footledge. RM 2014. Notcracker – 6B – As per Nutcracker, but use the footledge. Same grade in both directions. Oddstart – 6A – Start matched on the undercling. Use the footledge and climb straight up through the bulge to a good ledge. The Groove – 6A – Climb the groove, finishing on the high jugs above the right arete. The Groove Sans Footblock – 6C – This time, eliminate the protuding footblock. The Groove Right – 7A – Start on edges at the base of the right arete. Pull into the groove and work upwards. Eliminate the protruding footblock. RM 2014. Crucifixed – 7B – Make a hard move to gain the crack right of the arete, then finish on jugs above. RM 2014. The Ten Year Itch – 7B – Just right of the blank wall, tick-tack up twin cracks to gain good flat edges. Highball. RM 2014. Brick Shaped Dreams – 6C – Climb the arete of Yahoo! to gain the ramp, then move right and make crux moves to gain a good high jug. Backwards Magic – 7A+ – Take the Zendik crimp with LH and pull through to underclings just above. Finish on the high jug. RM 2014. Ring Ooze – 7B – Extend Tappings Of Power with hard moves to gain higher crimps, then bust rightwards to finish on high jugs. Paul Robins 2014. Meeting Palms – 7C – The arete left of Chicken Wings, finishing matched on the obvious super slopey shelf. Problem 7 in the guide. Dawid Skoczylas 2014. Note: Grade is a guess for average height people. If you are tall enough to keep feet on the break it isn’t 7C. Egyptology – 6C SIT 7A+ – Sitstart twin cracks left of the corner. Gain thin crimps, then make a hard move for a hold on the left arete, then finish on jugs in the break above. On the wall beneath Lancastrian HVS 5b, there are a couple of nice problems which finish at the break. This is the first obvious buttress left of Whisker. Lancastrian – SIT 5 - Sitstart on the footblock then get the chipped hold and finish on the break. Not the main attraction. Right of Red Wall and left of Fridgehugger are some slabs. 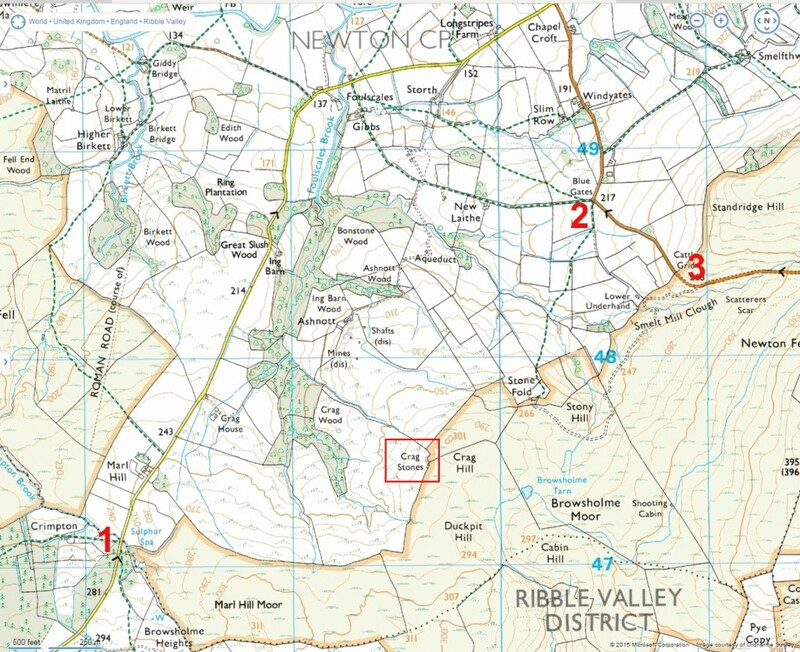 Important access note & changes to guidebook directions - Due to the erection of new fences, the parking described in the guidebook has become problematic for the farmer, who needs the space to turn his vehicle. Please do not use this parking spot. Please park next to the White House pub, as for Cow’s Mouth and Blackstone Edge. From here, walk towards Cow’s Mouth and continue on to the reservoir, with Stony Edge behind. This approach is slightly longer, but flat the whole way. NOTE: For the Pathside Roof, it’s now best to park at the bottom of the hill, near the canal, and walk up the road. Approx 20min. Baby Bouncer – SIT 6C+ - This has now been done from a proper sitstart, though shorter folk will struggle. No change in grade. A sitter from lower may be possible, but much harder. Argy Bargy – 6B+ - Climb straight into the finish of Argle Bargle. The Grit Award – SIT 7A+ - Sitstart the Argle Bargle arete and rock rightwards to gain holds on the ledge right of the arete. A weird mantel/flop move allows you to reach the top of the boulder. Problem 12 in the guide. RM 2014. A Is For Aardvark – 6A SIT 6B+ - A sistart has been added. Gritworm 6B SIT – 6B+ - This does go from a proper sitstart using holds right of centre, rather than just a low start. No change in grade. In the left bay, pg. 112. In the right hand bay. Bilateral Vasectomy – 6B – Just right of the arete problem Notch (21), climb the wall between the arête and corner, using the upper inner arête. Walk past the main quarry with the quarry on your left. After 100m there is another small quarry on the left. This contains one small undercut block with several squat-and-reach-the-lip problems. These are best done without using the low left plinth, or any footholds below the level of the allowed ledges. Grades from 6A to 7A. The landing is flat but drops away sharply after one metre – some will find this fine, others may not be happy without a spotter. A newly developed block is situated on the downhill side of the main approach track, some 80m past the Crag Boulders. Once level with the block (which can be seen from above) it is a further 10-15m down the slope. There is a small cairn on top of the block to make identifying it a little easier. The climbing is on the NE face. Uzi 9mm - SIT 6C+ – Sitstart on an obvious blunt nose hold beneath the lip and to the right of the Guns ‘n’ Ammo arete. Throw a heel on and match the sloper at the base of the arete, then follow the lip round and finish up Knights of the Turntables. In the Upper Crag sector, pg. 37. About 10m of Return Of The Fly. In the Recessed Bay, pg. 207, several lines have been done around Project 14. Landshark – 6B+ SIT 7B – Pull on just right of the arete, then traverse right across the face and up to the break. The arete is off-limits. No footledge. Stand RM 2014. Sitstart Mike Adams 2015. On the Little Buttress, pg. 209. Jack the Giant Slayer – 7C+ SIT 8A+ - Climb Magic Beans to the flat hold, then finish up the left side of the arete. Mike Adams 2016. There are some entertaining problems at the back of the boulders. In a small corner gully near the steam: there are some often mucky problems which are entertaining when dry. The Green Eyed Lobster – 6A – Just right of the corner, start LH undercling jam, RH shelf. Stay off the crack/arete. Gullet – 6B – Climb the centre of the wall with a tricky mantel to get started. In a tiny corridor at the centre of the boulderfield: the green wall has a sitstart. John’s Sitter – SIT 6A – Use protrusions and the good foothold to sitstart the centre of the wall. Project – To the left is a slanting rib. Sitstart this. The Move Footless - 7B – As described in the guide. Adam reckoned 6C/+, but he thought The Move was 6B. Adam Hughes 2015. Midgesquito Crimpelopes – 7A+ SIT 7B - A new sitter to the standup – Start from the big LH sloper and any crimp for RH. Gain the central hold and pull into the standup. Problem 2, page 166. RM 2014. VIDEO: https://www.youtube.com/watch?v=iqhNDTINBZk On the inside of The Prow. Jim’s Slab – 7A+ - The direct finish to Flywalk Slab, without stepping right to the finishing ledge of Flywalk. Jim Holmes, date unknown. Problem 18, page 169. On the slab, pg 181. Footless Fun – 6A - Just a daft bit of fun – smear up The Undercut without using hands, to finish stepping rightwards on the arete ledge. On the Hidden Wall, pg 178. Eliminate Crack – 6A+ - The project listed on Orange Wall. Climbed years ago by John Hartley et al. Sally – 6A - At the left end of the crag, the VS 5c Sally is a good highball above pads. Due to landing changes it is now a little taller and a little harder than it once was. Chunky climbing with interesting moves. Topping out past the heather is a little sketchy, much like the Long Back Wall at Brownstones. Sitting On Sally – SIT 6C – Sitstart the VS Sally at the left end of the crag. Stay off the crack out left (6A with this). Awkward moves lead into the standup. Drop off at good jugs or carry on to the top. Nowt But Chips – 7A+ SIT 7B+ – A strict version of Burnley Fish And Chips Since 1971. Climb the arete using no hand-holds further than 30cm from the arete itself. For the standing start pull on with LH bobbly crozzle, RH arete. The crux of the standing start is likely to be very size-dependant – longer-armed folk will be able to do it in one big stretch at an easier grade. RM 2014. The Ballad Of John Axon – 6A SIT 6B – A sitstart has now been done, using the arete to start. A tricky move via a small RH undercut leads to the huge sidepull and then the top. Dimple – 6B – An old problem that should really have been in the guidebook. On the wall right of the Burnley… arete, start as far right as possible on undercuts and traverse left to gain the good holds and finish up The Ballad Of John Axon. Pimple – 7A+ – A high variation of Dimple. From the furthest right undercuts, step leftwards onto the line of poor footholds and pull across the undercuts to finish up The Ballad Of John Axon. The low footledge used on Dimple is not allowed. RM 2014. Nemesis – LOW 7C – Climb the central crack in the red wall, on its right. Start standing with hands on the lowest undercuts. Sequency and thin. RM 2014. Further right the walls get taller. On the back wall of the quarry, just right of the corner is a clean arete. Visible over the gully from the car park is a short, tilted block. This is a nice 5min amble from the car – head to the dam and turn left. Drop down the slope when you are above the boulder. There are a few sitstarts and a good traverse. Bring a good pad (two for the traverse) as landings are rocky. Virgil – SIT 6B+ - Start matched on sidepulls. Slap the lip and continue straight up. Dante – SIT 6A+ - The central line, with a left-facing sitstart on underclings. There are some boulders on the opposite side of the valley to those described in the guidebook. To reach these, follow the reservoir track from the car park without turning at the dam. When the track makes a sharp bend to the left, there are two gates leading uphill. Take the second gate. Follow this path until you can turn left between a stone wall and a low line of rocks in a banking. Drop down when possible to reach the prominent Castle boulder or continue to reach the Ridge boulders. Body Slack – LOW 6A – The green wall right of the arete. Start crouched on the plinth, gain the shelf, then push rightwards on green holds to the top. 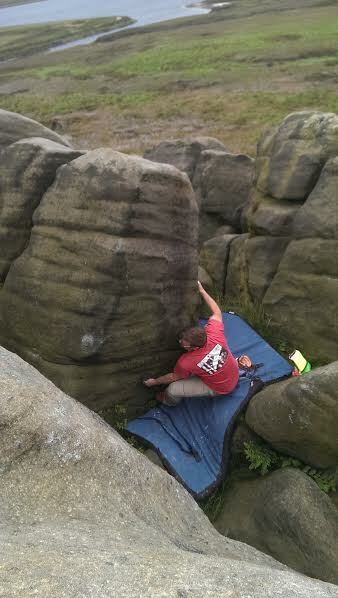 The Real Funk – 4+ SIT 5+ – Sitstart the arete and top out via the blobs. The Seal Punk – 5+ SIT 6B – Sitstart at the obvious edges and make a tricky move for the top, using the right arete as much as you like. Usw the right arete to pull over the lip. The Crunk – SIT 6C – Sitstart as per Veal Monk (no right arete) and traverse the lip leftwards to finish round the far left arete. Bitter Sitter – SIT 6A+ – Just right of the left arete, head straight up. Butter Flutter – SIT 6B – Climb via the large sloper and the positive crack. Back at the main crag, there is a fun cantilevered roof which offers a couple of entertaining lowballs. 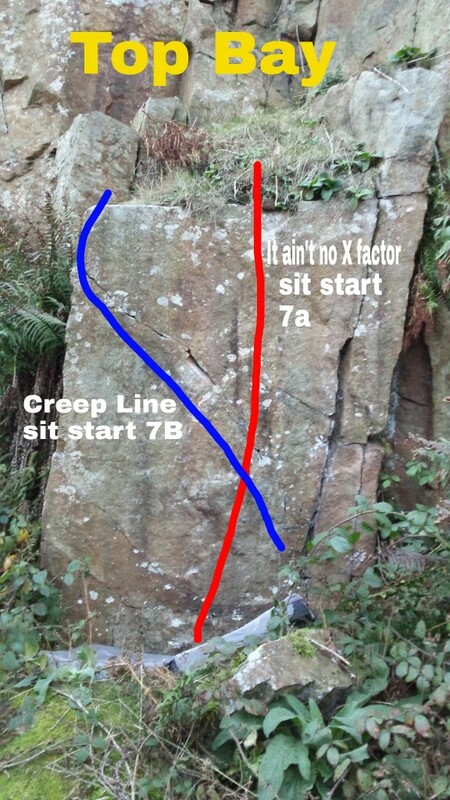 Si’s Slab – 5+ - The slab left of problem 7.